We make the Easter Eggs in our workshop. The Easter Egg comes in three sizes: Small, Medium, and Large. The egg is hand painted a rainbow of colors. The dimensions for the small egg are approximately 5.50 inches tall by 4.50 inches wide by 1.50 inches deep. The dimensions for the medium egg are approximately 8 inches tall by 11.25 inches wide by 2 inches deep. The dimensions for the large egg are approximately 17.75 inches tall by 12 inches wide by 2 inches deep. The small egg weighs approximately 4 pounds with packaging. The medium egg weighs approximately 6 pounds with packaging. The Large egg weighs approximately 8 pounds with packaging. For the continental U.S. shipping and handling is included in the listed price. For shipping outside the continental U.S. please contact us through our Contact Us page. We make the Green Striped Egg in our workshop. The Green Striped Egg comes in three sizes: Small, Medium, and Large. The egg is hand painted a rainbow of colors. The dimensions for the small egg are approximately 5.50 inches tall by 4.50 inches wide by 1.50 inches deep. The dimensions for the medium egg are approximately 8 inches tall by 11.25 inches wide by 2 inches deep. 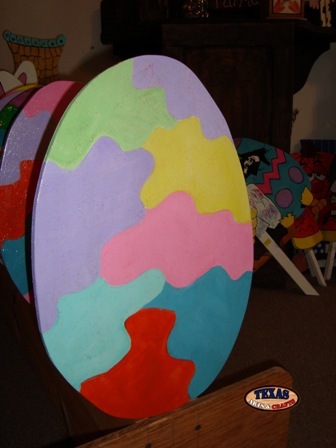 The dimensions for the large egg are approximately 17.75 inches tall by 12 inches wide by 2 inches deep. The small egg weighs approximately 1.50 pounds with packaging. The medium egg weighs approximately 2 pounds with packaging. The large egg weighs approximately 3.25 pounds with packaging. For the continental U.S. shipping and handling is included in the listed price. For shipping outside the continental U.S. please contact us through our Contact Us page. We make the Pastel Easter Egg in our workshop. The Pastel Easter Egg comes in three sizes: Small, Medium, and Large. The egg is hand painted a rainbow of colors. We make the Pink Striped Egg in our workshop. The Pink Striped Egg comes in three sizes: Small, Medium, and Large. 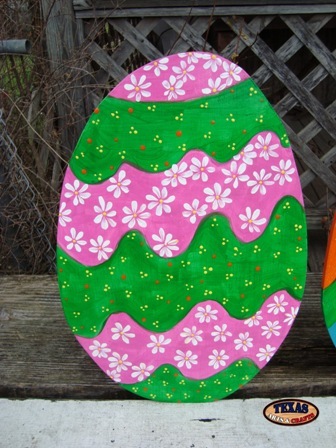 The egg is hand painted with pink, yellow, and green stripes. We make the Egg With Flowers in our workshop. The Egg With Flowers comes in three sizes: Small, Medium, and Large. 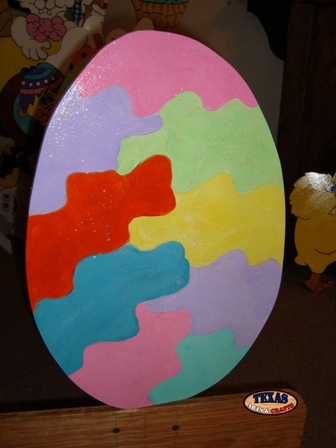 The egg is hand painted yellow, blue and pink. There are also flowers painted in the pink sections. We make the Rainbow Colored Egg in our workshop. The Rainbow Colored Egg comes in three sizes: Small, Medium, and Large. 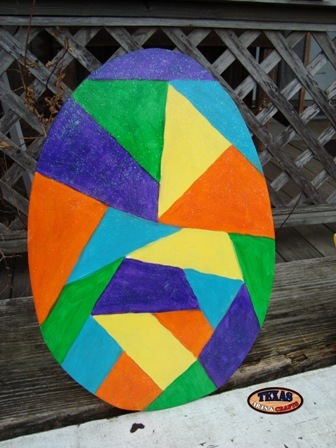 The egg is hand painted with a rainbow of colors. We make Three Striped Eggs in our workshop. The Three Striped Eggs come in three sizes: Small, Medium, and Large. The eggs are hand painted with a rainbow of colors. The dimensions for the small egg are approximately 5.50 inches tall by 4.50 inches wide by 1.50 inches deep. The dimensions for the medium egg are approximately 8 inches tall by 11.25 inches wide by 2 inches deep. 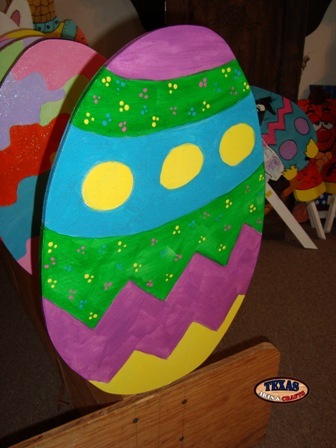 The dimensions for the large egg are approximately 17.75 inches tall by 12 inches wide by 2 inches deep. The small egg weighs approximately 3 pounds with packaging. The medium egg weighs approximately 5 pounds with packaging. The large egg weighs approximately 8 pounds with packaging. For the continental U.S. shipping and handling is included in the listed price. For shipping outside the continental U.S. please contact us through our Contact Us page. 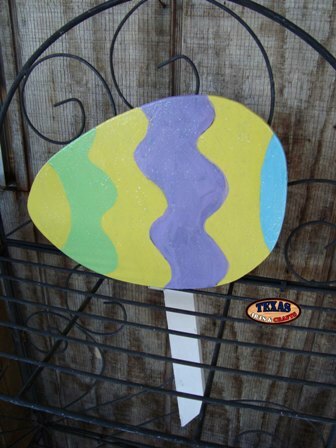 We make Three Decorated Eggs in our workshop. 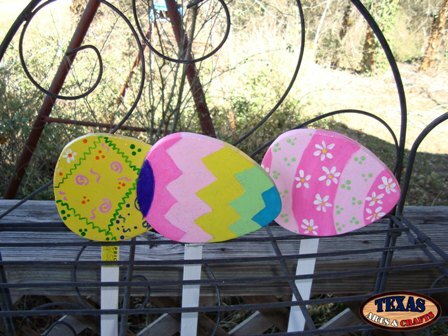 The Three Decorated Eggs come in three sizes: Small, Medium, and Large. The eggs are hand painted with a rainbow of colors. We make Three Flowery Eggs in our workshop. The Three Flowery Eggs come in three sizes: Small, Medium, and Large. The eggs are hand painted with a rainbow of colors. We make Three Flower Decorated Eggs in our workshop. 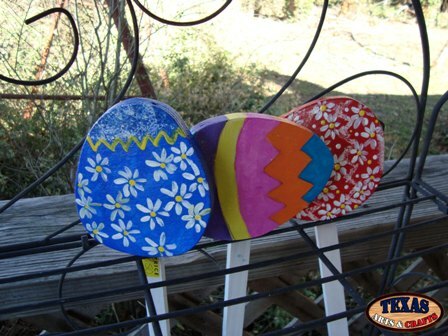 The Three Flower Decorated Eggs come in three sizes: Small, Medium, and Large. The eggs are hand painted with a rainbow of colors. We make Rainbow Colored Eggs in our workshop. The Two Rainbow Colored Eggs come in three sizes: Small, Medium, and Large. The eggs are hand painted with a rainbow of colors. The dimensions for the small egg are approximately 5.50 inches tall by 4.50 inches wide by 1.50 inches deep. The dimensions for the medium egg are approximately 8 inches tall by 11.25 inches wide by 2 inches deep. 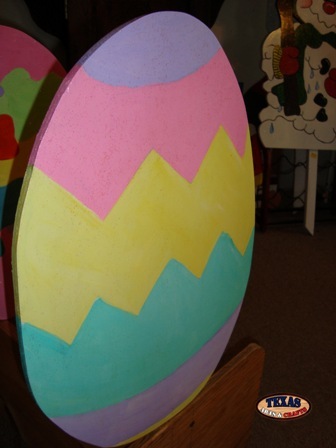 The dimensions for the large egg are approximately 17.75 inches tall by 12 inches wide by 2 inches deep. The small egg weighs approximately 2 pounds with packaging. The medium egg weighs approximately 3 pounds with packaging. The large egg weighs approximately 4.50 pounds with packaging. For the continental U.S. shipping and handling is included in the listed price. For shipping outside the continental U.S. please contact us through our Contact Us page. 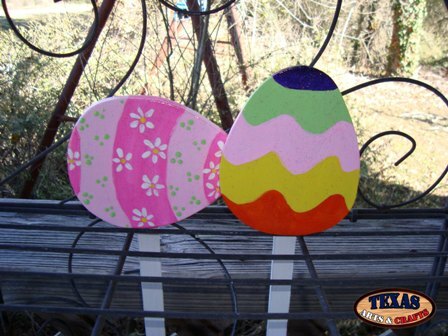 We make Two Decorated Eggs in our workshop. 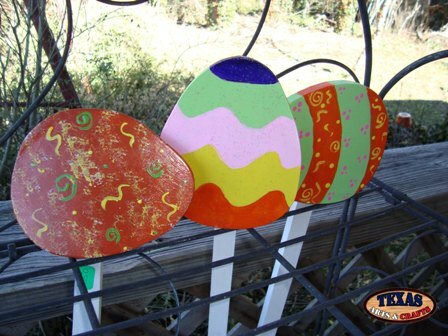 The Two Decorated Eggs come in three sizes: Small, Medium, and Large. The eggs are hand painted with a rainbow of colors. 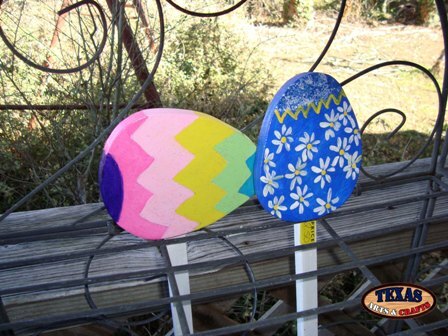 We make Two Flower Decorated Eggs in our workshop. 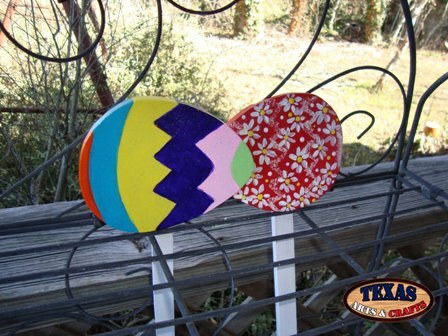 The Two Flower Decorated Eggs come in three sizes: Small, Medium, and Large. The eggs are hand painted with a rainbow of colors. We make Two Easter Eggs. The Two Easter Eggs come in three sizes: Small, Medium, and Large. The eggs are hand painted with a rainbow of colors. We make Two Spring Eggs in our workshop. The Two Spring Eggs come in three sizes: Small, Medium, and Large. The eggs are hand painted with a rainbow of colors. We make the Colorful Easter Egg in our workshop. The Colorful Easter Egg comes in three sizes: Small, Medium, and Large. 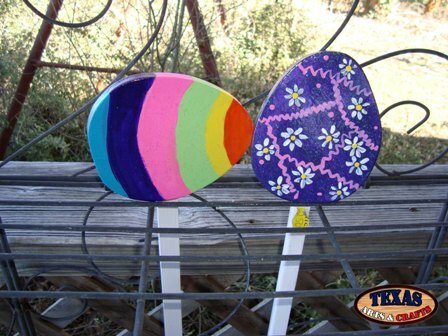 The egg is hand painted with a rainbow of colors. We make the Daisy Easter Egg in our workshop. The Daisy Easter Egg comes in three sizes: Small, Medium, and Large. The egg is hand painted with a rainbow of colors. We make the Jagged Easter Egg in our workshop. 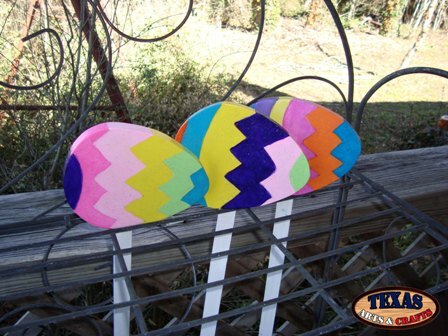 The Jagged Easter Egg comes in three sizes: Small, Medium, and Large. The egg is hand painted with a rainbow of colors. We make the Pastel Colored Easter Egg in our workshop. The Pastel Colored Easter Egg comes in three sizes: Small, Medium, and Large. 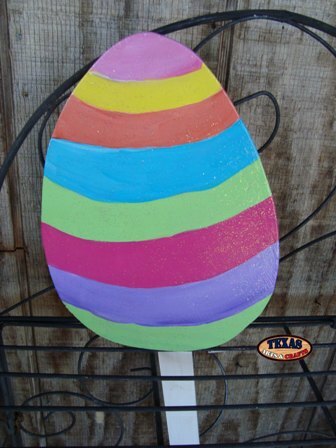 The egg is hand painted with a rainbow of pastel colors. 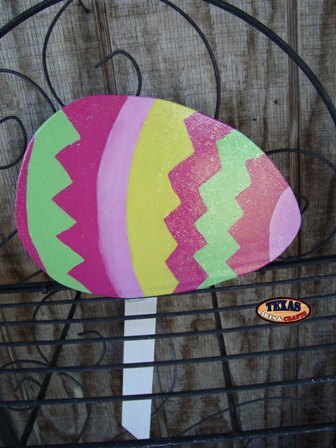 We make the Pastel Waves Of Color Easter Egg in our workshop. The Easter Egg comes in three sizes: Small, Medium, and Large. 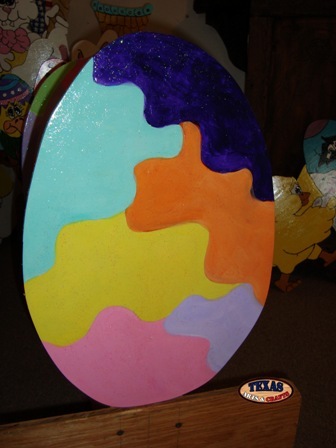 The egg is hand painted with a rainbow of pastel colors. We make the Spring Easter Egg in our workshop. The Spring Easter Egg comes in three sizes: Small, Medium, and Large. The egg is hand painted with a rainbow of colors. 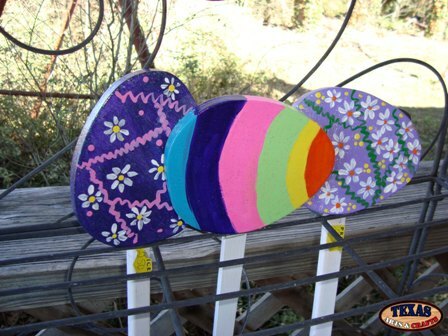 We make the Waves Of Color Easter Egg in our workshop. The Easter Egg comes in three sizes: Small, Medium, and Large. The egg is hand painted with a rainbow of colors.